Kagawa may be Japan’s smallest prefecture but it boasts a friendly and distinct cultural spirit. Situated on the adventure island of Shikoku, Kagawa is also commonly known as the “udon prefecture”. Aside from the vibrant and diverse port city of Takamatsu, there are also many outlying islands which surround this prefecture and each one has its own uniqueness and local specialties. With plenty to see and do, there really is something for everyone. Undoubtedly Kagawa’s most famous dish, this stuff is so popular that the prefecture has been named after it. It’s near impossible to pass by a few street blocks without spotting a quaint little udon noodle shop. Keep in mind that udon is typically a breakfast food for Kagawans so many shops close early to midafternoon. However you’ll have no trouble finding udon for a late lunch or dinner. It pays to try out a few places as there are many different variations of udon. Some are more traditional whereas others appear to be more contemporary with a modern twist. There are some places that offer limited time specials or seasonal dishes, too. There are also udon-making schools for those who wish to try their hand at making the delicious noodles. One of three castles in Japan encircled by water, the moats of Takamatsu Castle are filled with salt water from the Seto Inland Sea. The castle is situated right beside Takamatsu port and harbor. Although the main castle tower is no longer standing, the two yagura (watch towers) along with the main gate are still very much visible and intact. Once inside the castle grounds, visitors can take in the beauty of the elegant Japanese gardens and browse the charming little bonsai trees for sale outside Hiunkaku. This structure was originally built as another home for the 12th feudal lord of Takamatsu. The building boasts a number of rooms with various natural themes. These days, is it used for tea ceremonies and other events. Towards the back of the property is a large field which offers a perfect backdrop for a summer picnic. In spring, this a popular cherry blossom viewing spot as there are plenty of trees scattered across the grass. The 88 Temple Pilgrimage is a walking route specific to Shikoku. The 1200km round trip weaves its way around 88 temples and takes, on average, about six weeks on foot. Although many travelers walk the temples, there are also the more convenient options of a car or public transport. There are over 20 temples to discover in Kagawa alone. The pilgrims who endeavor on the journey are known as Ohenro-san. If you do decide to walk part of the trail and wish to really take advantage of the Henro Pilgrimage experience, why not don the white over clothes, walking stick and straw hat? The locals will be delighted. There are also stamps at every temple where pilgrims can mark pages in a special book. These are available at a select few temples and are a nice token of the whole experience. So, put on some decent walking shoes and dress comfortably and appropriate for the weather conditions, especially if you plan on walking much of the journey. Basque in the beauty of a Sunport sunset. This is the popular area down by the Takamatsu ferry ports. Grab a cold beverage from a nearby convenience store and catch the incredible sight of the sun setting beyond the Seto Inland Sea. The best sunsets take place on a calm, clear evening so be sure to check the weather forecast on the day to take advantage of some stunning photo opportunities. The famous “Art Island” of Japan is a true gem of Kagawa. With its world renowned art museums and funky sculptures dotted around the place, Naoshima attracts foreign and national travelers alike. 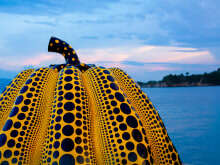 The red and the yellow pumpkin sculptures are iconic landmarks of the island and are quite impressive, as are the three art museums. The Chichu Art Museum houses some interesting pieces along with a few works by impressionist painter Claude Monet. The other two – the Benesse House Museum and Arthouse Project are also worth viewing for those with a keen eye for contemporary artworks. Hours: 10:00am – 6:00pm (March-September), 10:00am – 5:00pm (October–February), closed Mondays. Just like the other prefectures of Japan, Kagawa has a number of onsen, or hot spring public baths. One onsen that particularly stands out in this area is Busshozan (pronounced Bush-hosan) Onsen. A relatively new complex not far from Takamatsu city center, the facilities are modern and clean, and both indoor and outdoor baths are available. There is a restaurant and rest areas on site so guests may relax before and after their bath. Sanuki City is situated on the northeast side of the prefecture. Perfect for a day trip from Takamatsu, it offers a few temples which are included in the Henro Pilgrimage. In Tsuda, a small town by the sea, the inviting beach atmosphere is a popular destination. Festivals are held during the summer and autumn months. One festival in particular is held in early October. Many people from the community carry large portable shrines from the temple down to the shoreline. Kinrin Park is located alongside the beachfront and is a peaceful spot for picnics and gatherings. There is a small, red memorial bridge in the park called the ‘Come True Bridge’. It has been said that if you tell the bridge your wishes as you cross over it, they will be granted to you. In Shido, the Hiraga Gennai Memorial Museum, was established in honor of the talented inventor and his life’s work. It provides informative insight into the life and innovations of Hiraga Gennai along with interesting artifacts dated back to the Edo period. From the museum, Shido-ji Temple is a short walk down the aging streets of Sanuki. The pagoda is impressive and towers high over the temple grounds. Both the museum and the temple are within walking distance to the Kotoden Shido train station. The ascent towards the top of Mount Yashima lookout is a steep incline but is well worth the effort. Rest stops are scattered along the walkway where shrines take residence underneath the thick canopies. Upon arrival at the plateau, visitors can enjoy a sensational, panoramic view of Takamatsu City and the outlying suburbs and islands. Dine at the hilltop cafe while gazing out over the city. A few different types of udon are on offer along with hot and cold beverages. The matcha (green tea) and mochi (jelly-like dessert) set is recommended; a pleasant refreshment after reaching the top of the mountain. Try your luck at throwing the clay discs down the cliff and through the rings – if you succeed, luck will be sure to come your way. Yashima-ji Temple is tanuki (raccoon dog) territory. Statues of these little guys are everywhere around the temple grounds, including the female tanuki. In Japan, tanuki are a symbol of good fortune. One of the souvenir shops nearby sells ceramic tanuki in varied sizes so, if you wish, you may take some good fortune home with you. Past the temple gates lies a pond where the Battle of Yashima took place in 1185. Swords were washed in this pond after the great battle and it is said that the pond turned red with the blood of the victims. The Treasure House museum, next to the temple, houses artifacts and weapons used in the battle. One of the longest undercover shopping arcades in Japan, there is an endless assortment of shops, bars and restaurants running along both sides. Alleyways and side streets branch off the main arcade route which lead to even more dining and shopping possibilities. Take a wander – you’ll be surprised at what you find. If it’s an island escape you’re after, the “Olive Island” of Shodoshima offers a wide range of activities and sights. With its chilled Mediterranean vibe and vast olive groves, this island is the perfect place for some R&R after a day’s exploring. The olives that are grown here at Olive Park are made into oils, lotions, soaps even ice cream. Be sure to try an olive soft serve. There is an olive museum dedicated to educating visitors about the olives and the processes in which they go through to create their products. Further around the island is Angel Road, an expansive beach with the sea on either side. When the tide comes in, the beach isn’t as accessible so it’s best to visit when the water levels are low. Kankakei Gorge is a popular sightseeing spot and one of Japan’s most beautiful scenic locations, especially in the autumn months. The rope-way takes travelers up to the peak, looking out over the valleys below. Alternatively, there is a reasonably easygoing hiking trail. There are numerous quaint little bars in the city. Here are a couple of the ones that are popular with foreign residents here or those hoping to brush up on their English abilities. Palms – offers “English Mondays” where anyone keen to converse in English is welcome to come along. There are great deals on drinks and meals. Amazon – a neat little place tucked away on the second floor of a side-street building. Amazon offers a relaxed and cool atmosphere. All drinks are ¥500 and the bartender can make almost anything you ask for. Not to mention, his English is great. The trail up isn’t too demanding and there is pleasant scenery along the way. The temple site is reasonably spread out and features a bright red pagoda, a number of shrines and, of course, the temple itself. From the top, the viewing point offers stunning sights of the suburbs below. A cable car takes visitors up and down the hill which runs daily every 30 minutes from 7:30am – 5:15pm. After two towns merged into one in 2005, Kanon-ji was created. A modern city on the west side of the prefecture, Kanon-ji is accessible by car and the JR line train. The main highlights are the Zenigata Sunae, Ichinomiya Park and Mount Unpenji. The Zenigata Sunae is a giant sand coin etched into the ground just off from the beach. It is about the size of a large sports field. Many stories have arose about its unique origin. Some say that the local community all pitched in to create the enormous sculpture in just one night. Whether this is true or just legend remains a mystery. A serene setting right in the heart of Takamatsu, Ritsurin promises a quiet and relaxing escape from the hustle and bustle of the city streets. A walkway outlines the perimeter of the park so it is the perfect place for a leisurely stroll whilst enjoying the beautiful ponds and gardens. Be sure to check the information board at the entrance of the park which displays the current flora in accordance with the seasons. From mid-November to early December, the park is donned in lights for a winter illuminations display. Experience the magic of the Kotoden. These electric trains have been running in Kagawa for over 70 years and provide passengers with a pleasant commute across a system of three railway lines. All lines pass through the main city station of Kawaramachi and extend to the towns of Kotohira, Shido and Nagao, in east and west Kagawa. The Kotohira and Nagao lines also arrive at and depart from Takamatsu-Chikko station near Sunport and Takamatsu Port. Tickets can be purchased from automatic ticket machines at all stations. Alternatively, Iruca train cards are easy and convenient and are available at some of the main stations. These are highly recommended for travelers staying in Kagawa for a lengthy period of time. Ferries run from Takamatsu Port to the outlying islands and back.